Wow. A wonderful and possibly intimidating few anthem minutes, as the mythic ‘whole of Ireland’ stands tall, is followed promptly by a remarkably assured and attacking two minutes from the visitors. Farrell fires one riskily wide but flat; a further sharp exchange and May is in. The skipper caps off a stunning start with a crisp conversion. 7-0. The try scorer then hurries a clearance kick to enter touch on the full: the subsequent phases end with mark being called by the same player, under some pressure. Play goes back, though, for a penalty and Sexton pots an easy one. Game on, inital nerves shed. Playing conditions are significantly better than in Paris but it’s already clear that Proper International Rugby has broken out, here. The only notable error in the first 13 minutes is from the England flanker Curry, who misjudges a hit on Earls and is binned. Marginal but nonetheless infuriating for Eddie Jones, after an impressively solid start from his side. Ten demanding minutes to come. They survive it, manfully throwing a blanket across the park – even breaking out, at times. It’s tense but the players look watchful and engaged. Ironically, 45 seconds after Curry’s return, Ireland batter a way over in the corner. The combination of forward power and relentless baying from an impassioned crowd enough to make that score inevitable. Sexton drills a beauty through for the extra points. 10-7 after 26. England respond. Farrell and Daley dink a couple of probing kicks to test out the new fullback’s mettle. Henshaw is quality, for me but the second of these does create some angst – to the point that Daley drops onto the resulting spillage, in Stockdale and Ireland’s ‘Huget moment’. Farrell dismisses the conversion through the sticks, magnificently. 10-14 now, to England. It may not be exhilirating but this is engrossing – raw competitive in the extreme but disciplined, largely and fluent enough. England look close to their powerful, all-court best, as the half approaches. Best throws a skewed one, close to his own line and England have the scrum five yards out. The melée delivers nothing conclusive. Neither does the review; Vunipola is denied, reaching and diving for the score. Penalty given, mind, and again Farrell smashes it through nervelessly. 10-17 does not flatter England as the ref blows. Cat and mouse for ten minutes. Then England surge through the phases, left and right. They seem destined to grab more, possibly decisive points. They don’t. Instead their attack breaks down and Ireland hoof ahead. Again the ball on the ground proves murderous. From nowhere, Ireland have pressure: ultimately that counts. Sexton penalty, 13-17. As expected, defence from both teams is both organised and brutal. Everybody appears to be tackling like Tuilagi. England lose Itoge, injured and the changes start. Almost shockingly, the flawless Farrell misses a presentable penalty and the tension ratchetts up yet further, despite the measure of control exercised by the men in white. Joy for Slade as he combines with May before winning the foot-race to the line. It’s reviewed (for possible offside) but the try counts. In the 67th minute the visitors’ lead has stretched to nine points and their combination of composure and guts looks like it will tell. When Farrell makes a huge penalty – right at his limit – the lead is 12 points. Given that Ireland have very rarely threatened, this is now a relative cruise. Slade – looking strong and gifted on this most demanding of occasions – somehow intercepts, juggles and scores. Farrell converts. 13-32. Bonus point. We’re looking at an awesome win, a special marker, now. Fair play, Ireland respond. An opportunistic try, with Sexton drop-kicking the conversion as we enter stoppage time. It ends 20-32. 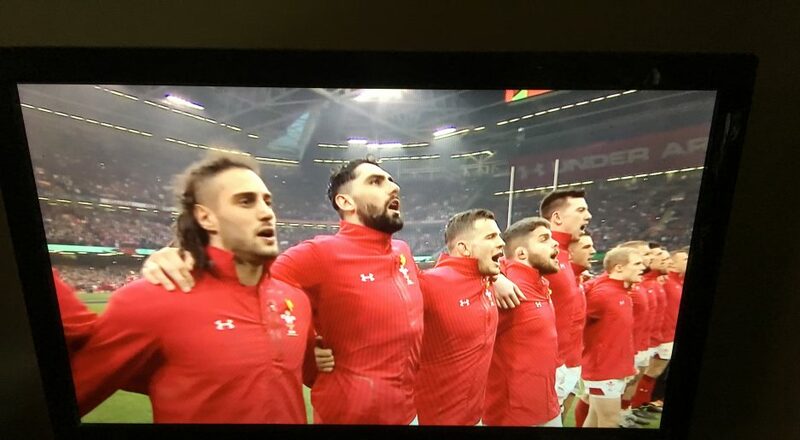 If Wales’s win yesterday was extraordinary for its deliriously scruffy drama, this was different level. Ireland are a fine side: today they were well, well beaten. Of course it’s merely the start but this was such a complete performance that England will justifiably be favourites for this tournament… and seriously competitive *beyond*. < Previous Great win but move on sharpish.